We do quite a few arty/ crafty projects probably because they are something that comes naturally to me and also because my oldest has always enjoyed them but my youngest is sometimes a bit more reluctant. He often joins in once his sister has started but I really wanted to find more art/ crafting projects that are aimed at him. So I have been thinking more about the themes of what we do and on a recent Amazon search I spotted these train stencils (just over £2) so I thought it might be something for my little man (He Loves Trains). I unpacked them and left them on the kitchen table along with some paper and oil pastels. And as soon as my son spotted them he wanted to try. We used a little bit of blu tack on the stencils to help keep them in place and he was off. He found the stencils easy to use and happily sat and made train after train. In fact for once the opposite happened. It was my youngest you really wanted to do the art activity and only after he had done a few did his big sister decide to join in. His big sister did suggest to him that it would be fun to add some of their own details to the pictures and he agreed. It is a very easy art activity – easy to set up, easy to clean up afterwards (we have only used the stencils once so can not comment on how long they last). We bought the train art stencils from Amazon for a little over 2 ponds, here is the link – Fun with Trains Stencils (Dover Stencils) . We also just used colour paper that we had in the house and our existing oil pastels. When it comes to oil pastels I love using them with kids as they are soft and easy for the kids to draw with but they do smudge. My kids have been using oil pastels since they were about 4 years old so they are not fussed by them smudging, they enjoy the texture and like the bright colours. I love that my youngest enjoyed this so much so I think I might add the Fun with Cars and Trucks Stencils (Dover Stencils) to his Christmas stocking and maybe the Fun with Flowers Stencils (Dover Stencils) to his sisters christmas stocking. 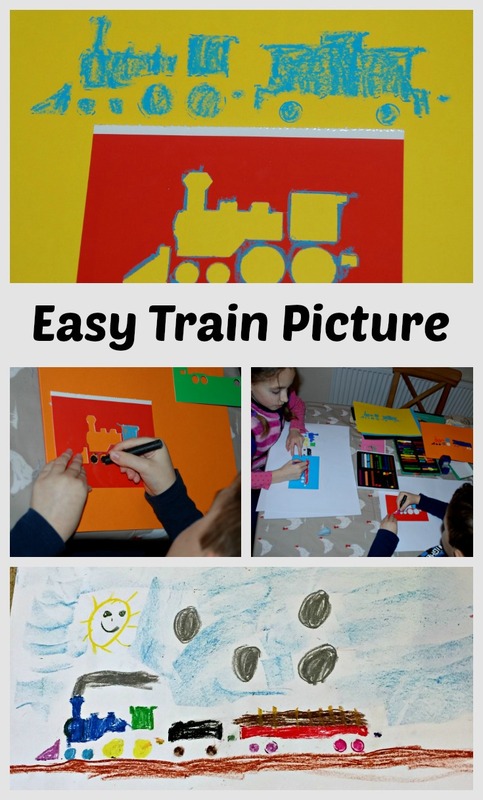 This entry was posted in Art and Craft Ideas and tagged children's art, easy art for kids, home ed, home education, stencils, train art, trains. Bookmark the permalink.